Last night Jack slept from 11 until 5:30 am! I won’t tell you that he slept next to me. Now I said that as soon as he gave me a good night of sleep that I would start my new workout DVD- The Shred which has 20 minute workouts on it. I can handle 20 minutes. It only took me 35 minutes to complete it with potty breaks, pat my back breaks, put my pacifier back in breaks etc. I ran and took a quick shower and placed Jack on the floor right outside my open bathroom door so that I could see him. I put on Blues Clues for the younger 4 (Grace was out on a special date with her Daddy) By the time I came back, I found three munchkins eating Doritos at the table. They are very resourceful. I cannot imagine what they will think of in the next couple of years. Poor girl, they conviced her that they all could play games at the same time. So they pulled out so many games including a bin of dry beans that I use for tactile play. The beans did not stay in the box and they had the the hardest time getting them all in the box and staying in the box. The triplets were a tad bit michievous last night. They knew she didn’t know all the rules and they worked her over! I am just thankful that she said she was willing to come back. I guess if you pay well, then they are willing to put up with chaos for a couple of hours. Poor Jack has been extremely gassy for the past 3-4 days. He is only happy laying in my arms. I wish there was a magical cure to make him burp and fart because he would be calmer and more comfortable. When I lay him down, within minutes he is pulling his legs in and grunting and then he starts crying. I have started cutting out milk out of my diet to see if it helps him. (But this is very hard for me. I LOVE a cold glass of milk with my meal.) I am praying that God will bring back the easy side of him real soon. My mom went home last night. After 3 weeks, I think my Dad and brother were missing her. I am so thankful for my mom. I could have never survived without her. She is one amazing Nana. She took Jack in the middle of the night so I could sleep and would just bring him back when he wanted to nurse. She baked us loaves and loaves of homemade bread. She was another pair of eyes…the triplets did not get away with much. She folded load after load of laundry. Ran my errands for me. Helped me to leave the house. and read many stories and had lots of snuggle time with each of the kids. So – thank you Mom! I don’t know if I will ever be as great of a Nana! Next time you come …you better bring Papa! as a two year old. Tomorrow she will be three. Tonight was the last night we tucked in a sweet two year old. My the time has gone by fast. We spent supper talking about her birth story. She wanted to hear it over and over. She especially like the part when we told her how she pouted for 20 minutes after she was born. I had a friend ask for a recommendation for an adoption agency. They already have 6 children and are finding it difficult to find an agency that will take them. 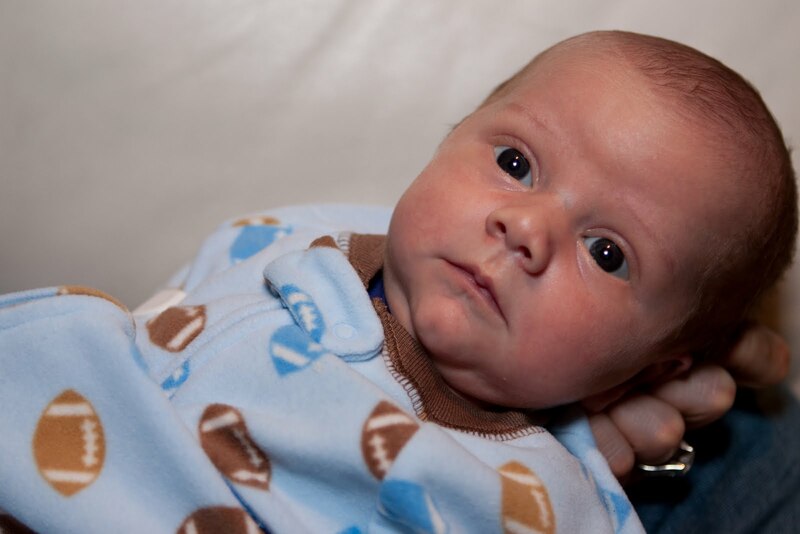 At his two week check today…10 lbs 3 oz. 23 inches long – that is a big boy! No wonder why some of his clothes don’t fit. I think he is so cute!